First in the First State! What is now Harington Raceway opened in 1946 as Kent & Sussex Raceway. It was the first pari-mutual track in Delaware. Located at the Delaware State Fairgrounds in Harrington it has only run standardbreds since it begin operation. 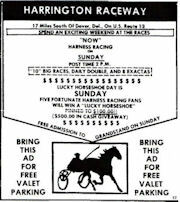 In 1996 the track received a boost when it was granted a racino license and became known as Harrington Raceway and Midway Slots. In 2011 Harrington Raceway split the year with Dover Downs as usual. Harrington races the spring and early fall meets with the summers off. Ross Wolfenden was the leading driver. I have visited Harrington Raceway a couple of times, it has an open air grandstand that seats 3,200 and an enclosed Clubhouse that holds another 400. Seating is not a problem at least not when I was there, it was another of those racino sites where the lights were on but nobody was home. There is unlimited parking but don't expect to park close to the track, all those people are hiding somewhere.